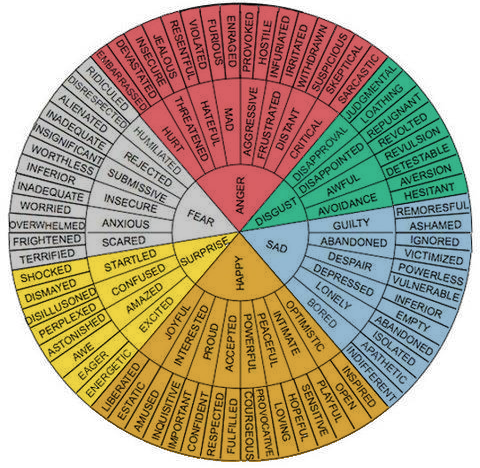 [Image of a wheel that describes a number of emotions and connecting them to related emotions. Anger includes eight emotions. Under hurt is embarrassed and devastated; under threatened is insecure and jealous; under hateful is resentful and violated; under mad is furious and enraged; under aggressive is provoked and hostile; under frustrated is infuriated and irritated; under distant is withdrawn and suspicious; under critical is skeptical and sarcastic. Disgust includes four emotions. Under disapproval is judgmental and loathing; under disappointed is repugnant and revolted; under awful is revulsion and detestable; under avoidance is aversion and hesitant. Sad includes six emotions. Under guilty is remorseful and ashamed; under abandoned is ignored and victimized; under despair is powerless and vulnerable; under depressed is inferior and empty; under lonely is abandoned and isolated; under bored is apathetic and indifferent. Happy includes eight emotions. Under optimistic is inspired and open; under intimate is playful and sensitive; under peaceful is hopefull and loving; under powerful is provocative and courageous; under accepted is fulfilled and respected; under proud is confident and important; under interested is inquisitive and amused; under joyful is liberated and ecstatic. Surprise includes four emotions. Under excited is energetic and eager; under amazed is awe and astonished; under confused is perplexed and disillusioned; under startled is dismayed and shocked.